Paseo del Norte/I-25 Interchange, the North Domingo Baca Multigenerational Center and Park, and the Cherry Hills Library are just a few of the projects Councilor Winter has worked tirelessly on to improve the quality of life for District 4 residents. The Paseo del Norte /I-25 Interchange was completed ahead of schedule and opened to the community in mid-December, 2014. More than 500,000 man hours occurring 24 hours a day, seven days a week, 250 sets of design plans, and $93 million went into the project. Fewer traffic signals and new overpasses allow for continuous flow of the 154,000 drivers per day that travel through the interchange. The saved travel time is estimated to be about one hour per week or about two days per year for the average driver. Project officials and workers thank the community for its patience during the construction. North Domingo Baca was a 14-year effort started in 1997 when the City bought most of the land for North Domingo Baca Park from AMAFCA. Since then the City has invested over $7.3 million for the land, preparatory work, and construction of the Center and Park. 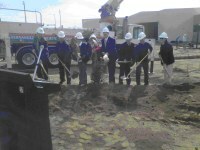 North Domingo Baca would not have been possible without the years of tireless support and effort from current and former State Senators and Representatives who sponsored grants: Larry Larranaga, Teresa Zanetti, Justine Fox-Young, John C. Ryan, Kent L. Cravens, Mark Boitano, and Diane Snyder. 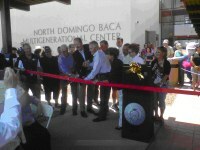 The tenacity and passion of the District 4 Community and City Councilor Brad Winter also made the North Domingo Baca Center possible for use by everyone - children, adults, and seniors. Constructed with the design work of Mahlman Studio Architecture, the craftsmanship of Enterprise Builders, and the oversight of the Senior Affairs and Municipal Development Departments. an Arts and Crafts Studio. 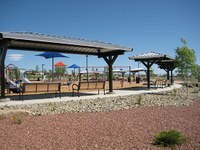 The Park was developed in multiple phases for a total of $13.7 Million over 14 years. 2014: Councilor Winter spent $85,000 to install brand new carpet into the Cherry Hills Library. The carpet that was replaced was over ten years old and the wear and tear was becoming a safety hazard for the frequenters of the library. 2013: Los Libros is a series of three sculptures in stainless steel by artist John Northcutt. The sculptures were installed on June 26, 2013.